So every once in a while, folks ask me why The Pres is called The Pres. Well, his sick parents named him after a certain President of the United States. Yes, both parts of his name. I’ll leave it up to you to figure out which President. On a probably completely unrelated note, last year’s road trip for us consisted of the Great Smokey Mountains and Mammoth Cave (as previously covered) and later meandered through Louisville (got to see the biggest bat in the world at the Louisville Slugger factory) and out to St Louis (going up the arch!) and then back home through Indianapolis (speedway and Kurt Vonnegut Museum and Library) and Dayton (Wright Brothers Museum). 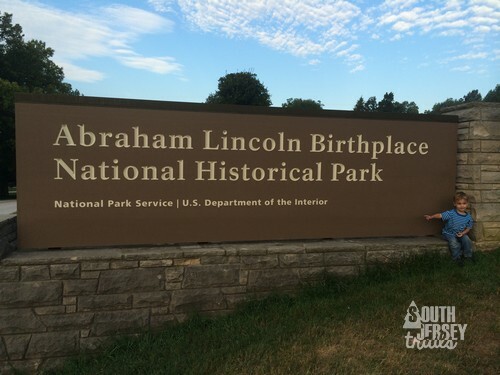 But the heart of it was stopping by nearly every place that Abraham Lincoln lived. 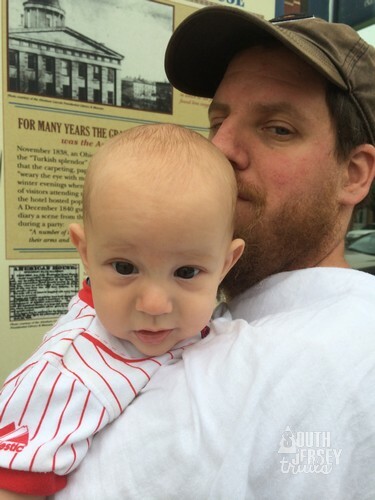 It started right after Mammoth Cave, when we headed for Hodgenville, Kentucky and the Abraham Lincoln Birthplace National Historical Park. 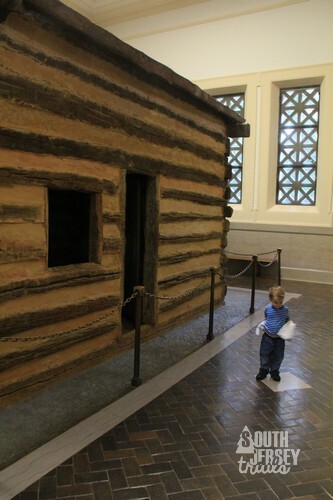 There, enshrined in a Greek temple, is the cabin where Abe Lincoln was born. 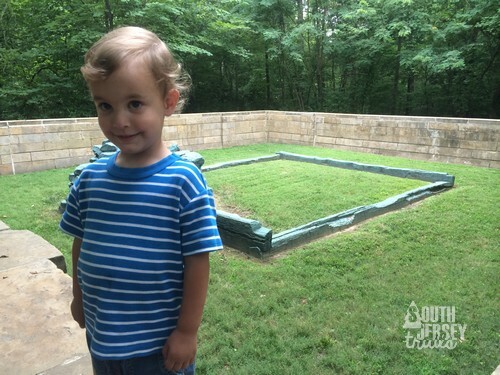 Well, it’s not really the cabin, they found the wrong one, but it’s symbolic of the cabin he was born in, and it’s on the right property at least, Sinking Spring Farm. 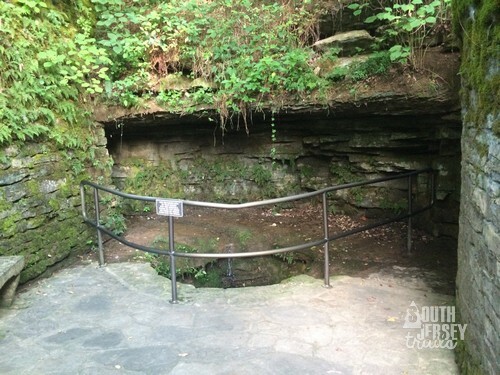 More impressive to me was the spring near the bottom of the steps, where Abe Lincoln would have had his first drinks of water from. And, of course, they have a museum with a good (and short) movie and some displays. 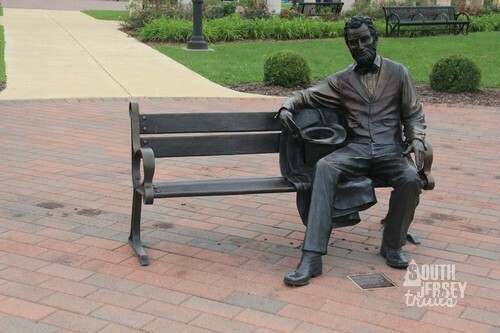 The Pres was particularly taken with the statue featuring Baby Abe Lincoln. We need this lifesize statue in our garden. 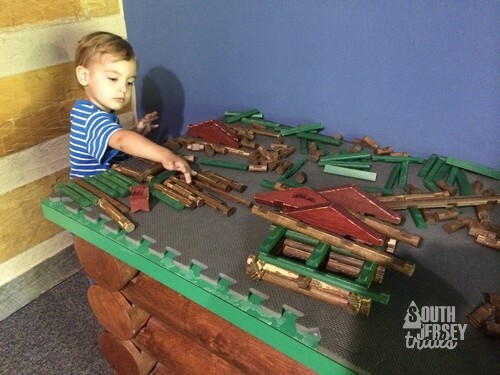 Also, Lincoln Logs in one of the nooks of the museum. I love it. Of course, I bought him a hat. He wore it everywhere for the next three days until my wife finally hid it. 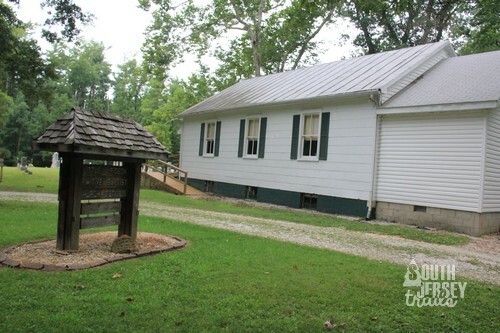 Hodgenville is unique, because it’s actually home to TWO Abe Lincoln homes. 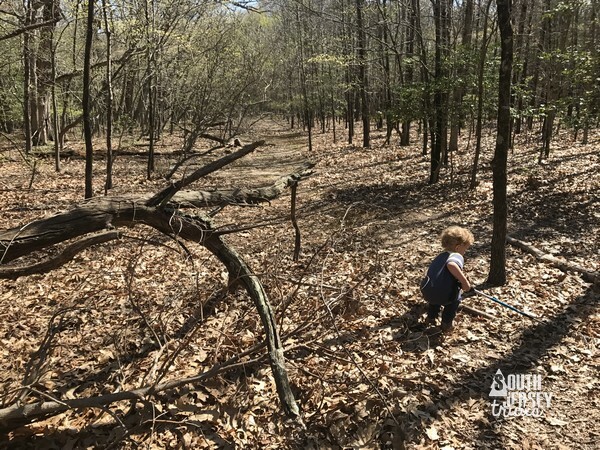 When Lincoln was only two, there was an argument over who really owned the property, which was common on the frontier in those days. 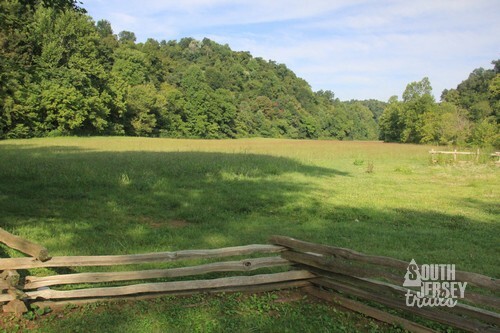 Abe’s father was forced to move the family several miles down the road to Knob Creek Farm. 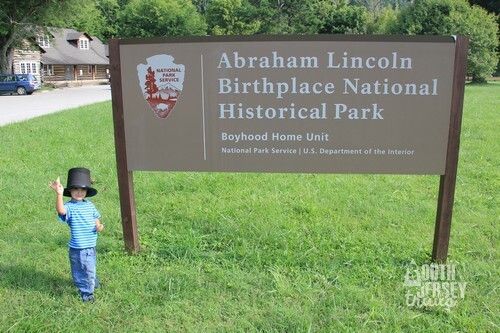 Abraham Lincoln’s first memories are from living here, although another land dispute forced them out when he was still a young boy. 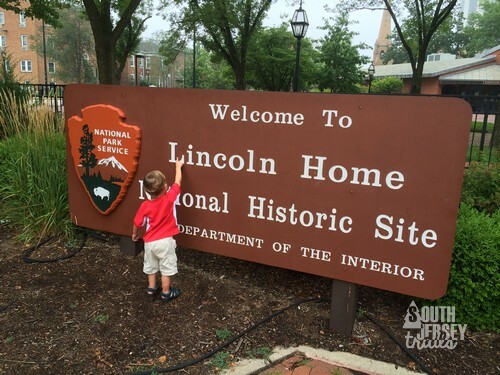 Site of Lincoln’s second home. 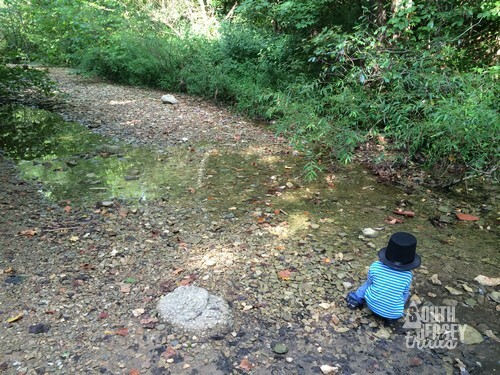 A young Abe Lincoln nearly drowned in this creek. Needless to say, it’s a lot more powerful in the Spring. 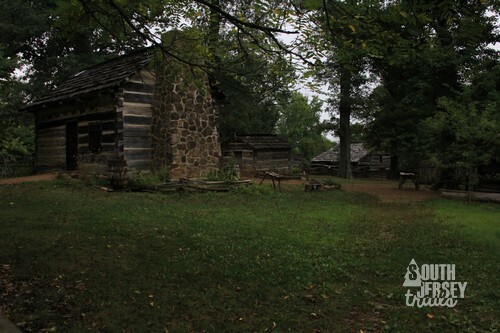 This cabin is also not Lincoln’s family’s cabin, but DID belong to one of their friends and neighbors. Also, this ranger was really awesome. 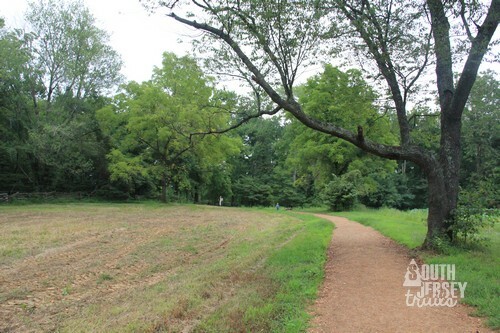 Fields where Lincoln would have worked and played. 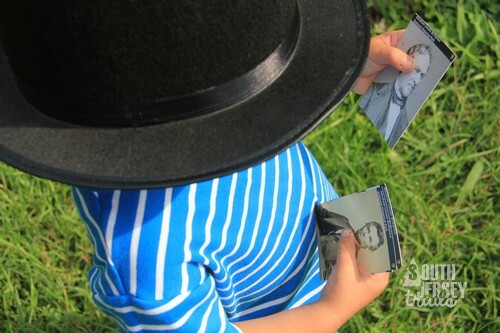 The ranger gave The Pres Abe Lincoln trading cards. Does life get any better than that? After that, we drove through Hodgenville, which was called Hodgen Mills when the Lincoln’s lived there. 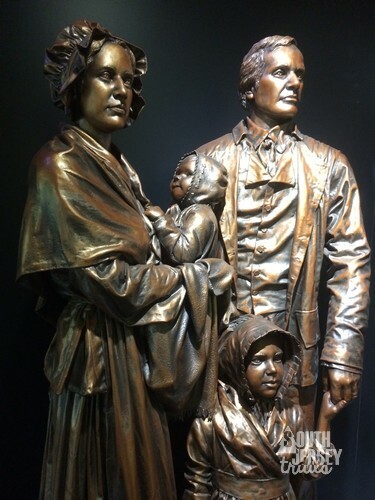 They are proud of being the birthplace of one of our greatest presidents, and have two statues of him in the center of town. 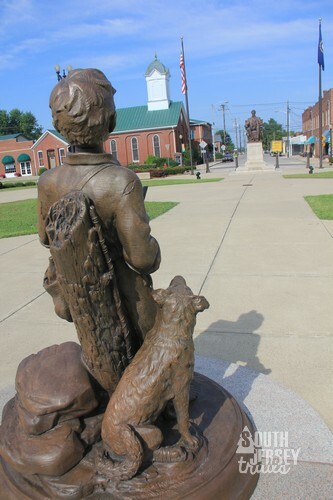 The statue of Lincoln as a boy looks toward the statue of Lincoln the President. Eventually, Thomas Lincoln became sick of the land disputes, and decided to move his family to Indiana, where such things were less of a problem. The fact that Indiana was a free state also factored into the decision. 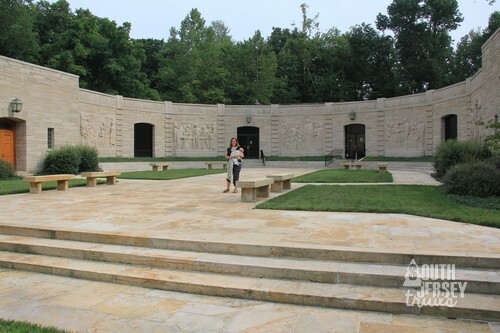 Like the Lincoln family, we too moved out of Kentucky, and on to Indiana to our next stop, the Lincoln Boyhood Home National Historical Park. 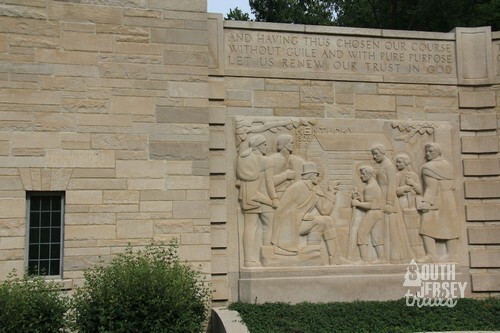 The Visitor’s Center here is something else, a massive building decorated with large reliefs of important points in Lincoln’s life. Inside, you can find Lincoln artifacts and displays. 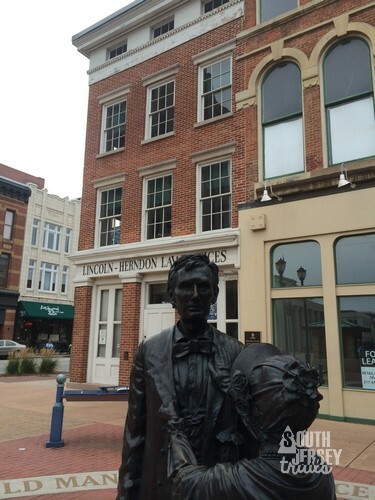 Here at Little Pigeon Creek , Lincoln spent the rest of his boyhood and most of his teenage years. 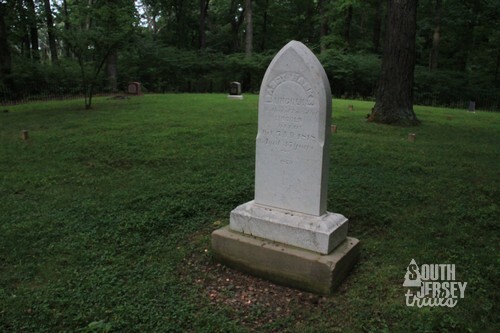 While land was less of a problem here, the Lincoln family suffered in other ways, as his mother died here of milk sickness. 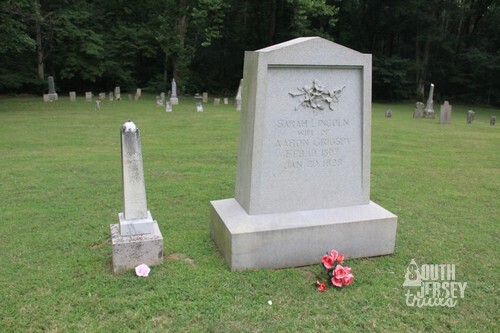 She is buried near the museum in the Pioneer’s Cemetery. Continuing down the path past the cemetery, you reach the fields that the Lincolns owned, where Abe spent many years of his life working. 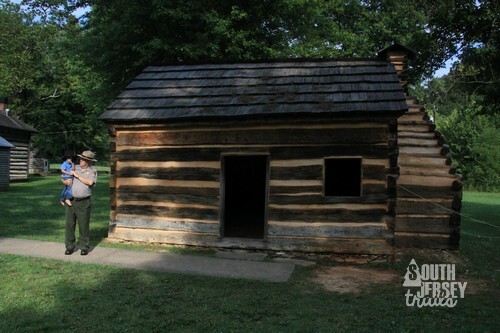 Then you arrive at the site of the small Lincoln cabin where he grew up. 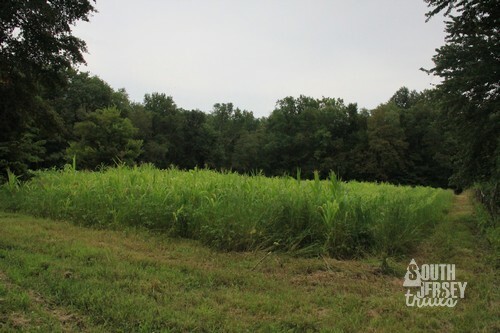 There are no wrong cabins here, no cabins at all, just the metal outline on the ground of where the cabin stood. Just past this is the reconstructed village of Little Pigeon Creek, which we peeked at, as it was closed by this late hour. 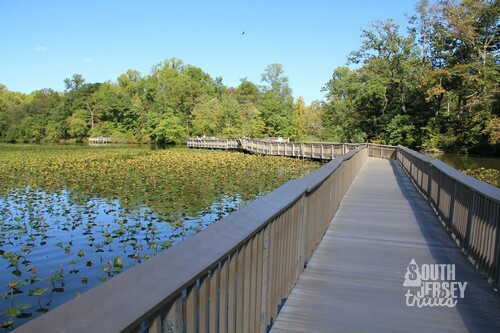 Next to the National Historical Site is the state park for the Lincolns, which includes much of the rest of the village site. This was also our camping spot for the night, yay! 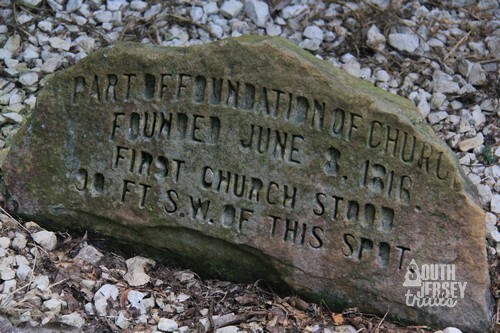 We checked out the church that Lincoln attended, which is also where his sister and her husband are buried. New building, still in use. 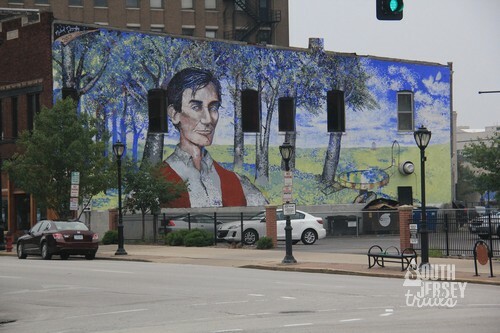 Several days later, we arrived in Springfield, Illinois, where Lincoln lived for most of his adult life, from his mid-20s until he was elected President of the United States. 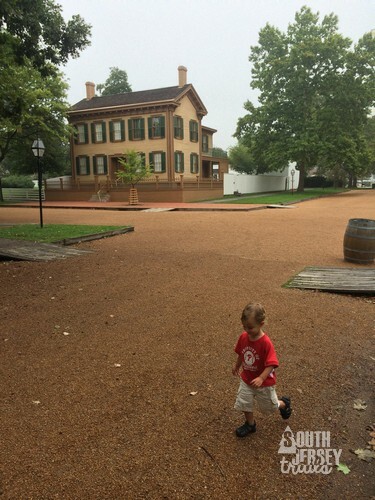 This too is a National Historical Park, with the surrounding homes preserved so that the street looks much like it did when Abraham Lincoln was elected. My wife, Alix, and I had been here four years before, but this was the first time for The Pres and four month old Tree Rider. We went on a tour in the early morning with the ranger. Fortunately, everyone else in the group had 4 to 7 year old children, so we weren’t too bad off! 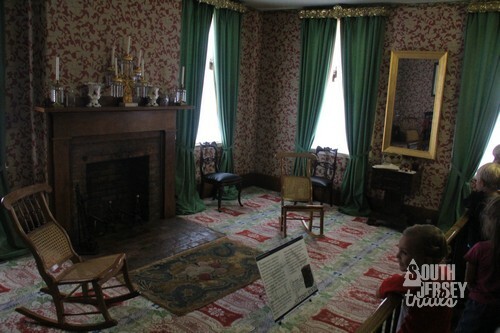 The Pres in the Lincoln sitting room. 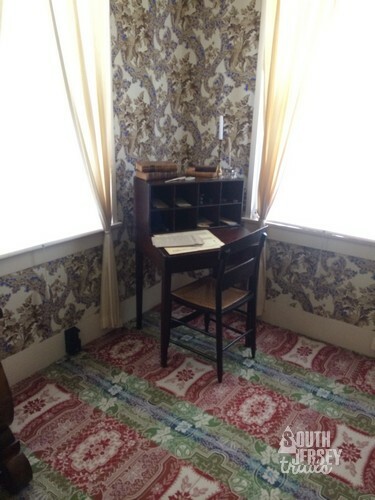 Desk where Lincoln wrote his “House Divided” speech, as well as his 1st Inaugural Address. This was tiny and cheap for a lawyer, and his wife even threw it away at one point. Lincoln fished it out of the trash, had his friend repair it, and snuck it back into the house. From there, it’s a short drive to the center of Springfield. 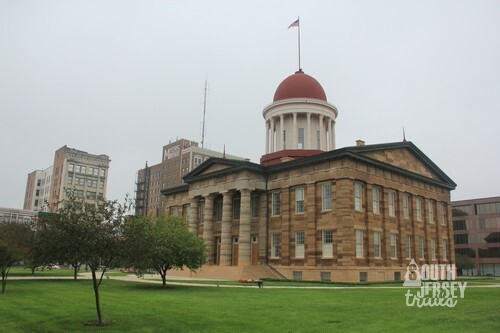 Here, we took a look at Lincoln’s law office and the state house. 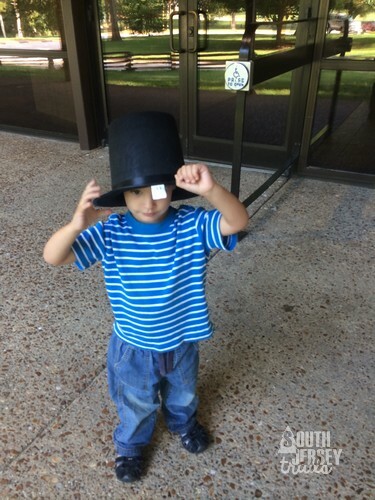 Lincoln in front of his office. Four month old Tree Rider was on this trip the whole time, I swear. 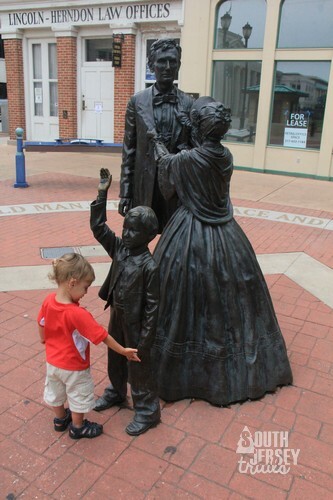 Trying to sneak into Lincoln’s family. 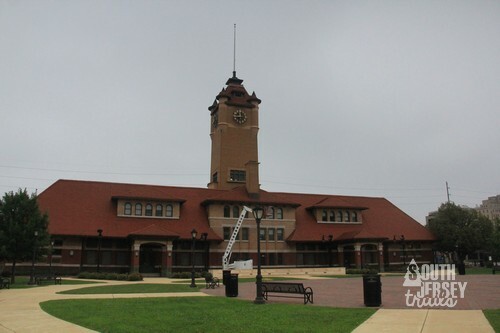 Afterward, we drove to the train station, the last place in Springfield Lincoln was alive. It’s also the way that his body came home after assassination. 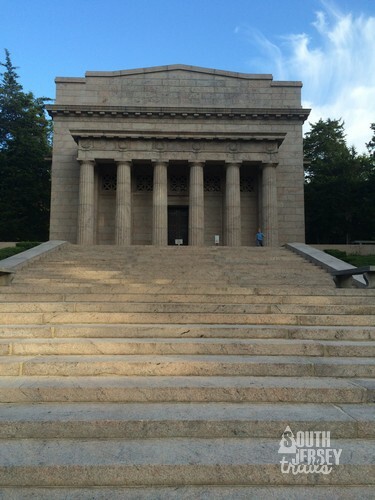 One final short drive put us just outside of town, at the tomb of Abraham Lincoln. It’s monumental in the literal sense of the word, a massive BUILDING of a tomb that you can walk around the inside of. The baby was being fed, but The Pres and I went in. 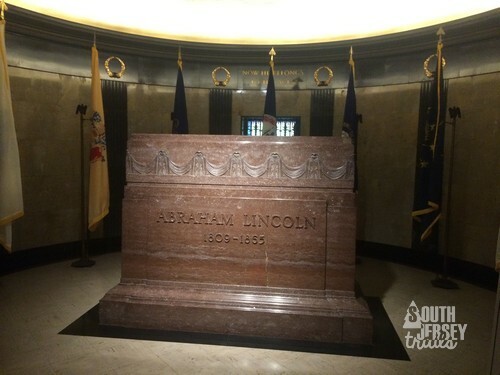 We ended up in front of Lincoln’s final resting place during a gap in the crowds, and were able to stand there for two minutes without anyone else around. It was a special moment as we paid our last respects to one of our greatest presidents. So that was it, the purpose of our vacation (with lots of other cool stuff thrown in) at an end. 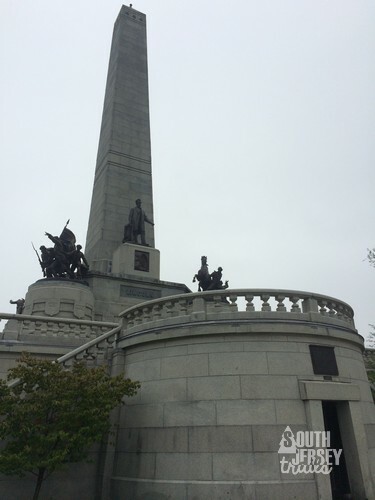 We had traveled from Lincoln’s birthplace, up through his boyhood and teenage years, into adulthood, and finally to his final resting place. It was something that I’ll never forget. 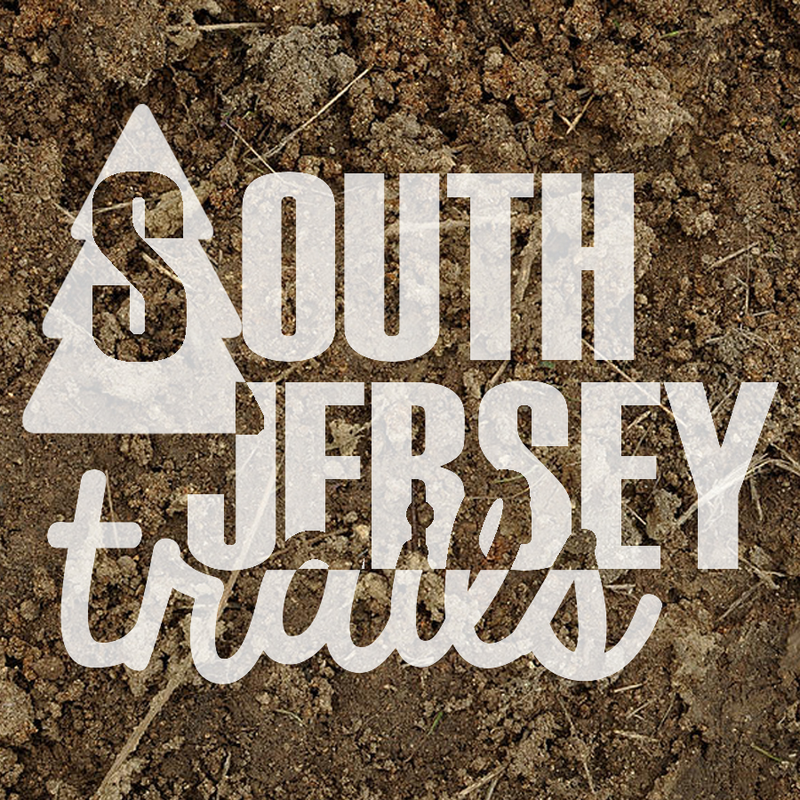 History, National Park, national parks, Outdoors. Actually, no worries, I always post waaaaay after our summer trip, so we were in Dayton last August when you were still on the trail. We’re headed out to Glacier next summer, will probably be through that way in June (way out) and/or July (way back), would love to meet up then if the time works out!